Photographer Keith Ellenbogen, a regular Aquarium blog contributor, is on the expedition capturing stunning underwater photos of marine life, like these images from dives near Orona Island. In a previous post we discussed evidence of human influence on the terrestrial side of Orona: ancient Polynesian villages, a more recent (2001) settlement project that was rather short-lived. But there is underwater evidence as well. 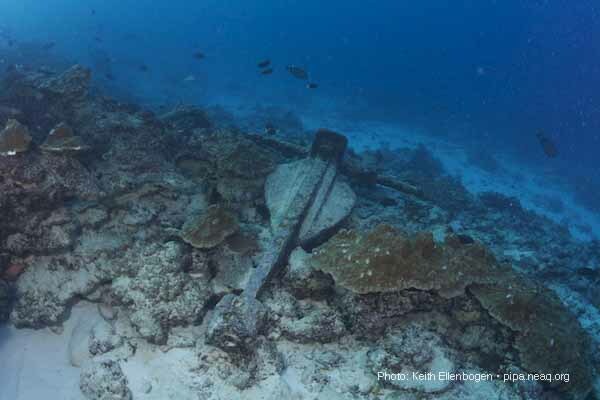 For example, abandoned anchors off of old ships lying undisturbed amidst the corals. 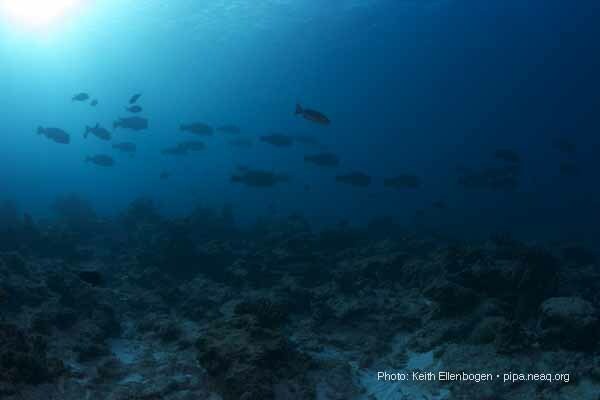 But there are also lingering global influences that are evidenced by what is NOT present on the reef. For example, lack of live coral. These mostly dead and overgrown coral skeletons are remnants from previous bleaching events, the most severe of which occurred in 2002-2003. All is not lost, however. 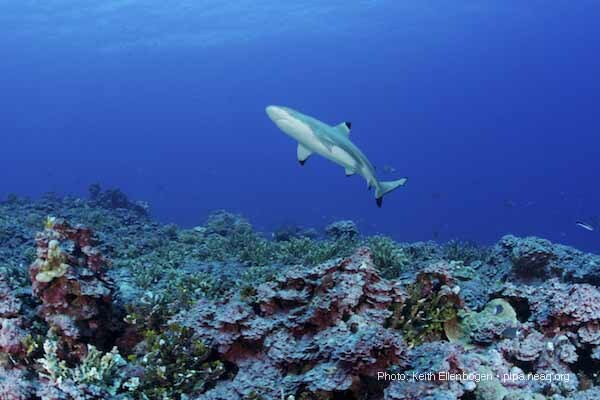 As was found on the 2009 expedition, the reef was seen to be rapidly recovering from bleaching, thanks in part to reef herbivores that were keeping the dead substrate clean and ready for coral recolonization. Thanks to these coral reef "lawnmowers", the reef is mostly free from the weedy macroalgal species that are competitively dominant. 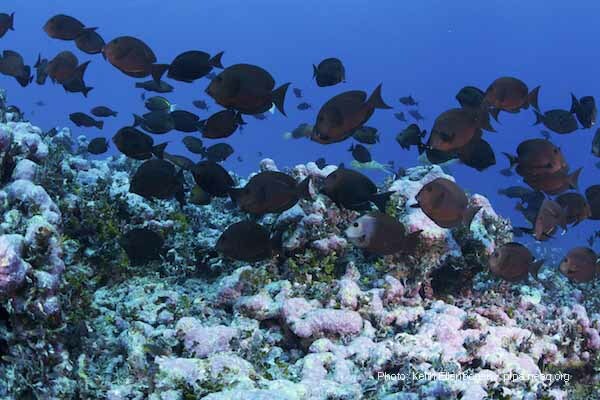 Instead, the reef harbors mostly Halimeda (a green calcareous algae) and CCA (crustose coralline algae, in pink), which do not impede the resettlement of corals. 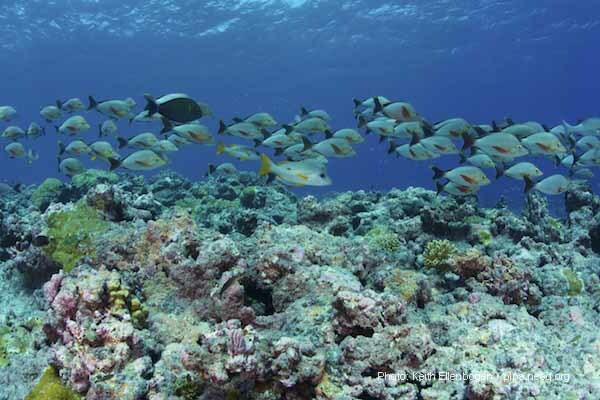 The presence of such high abundance and diversity of fishes is likely a key part of reef recovery. Part of the beauty of PIPA is that all of the island-surrounding reefs are part of the no-take portion of the MPA, which means no fishing. No fishing AT ALL. Hopefully, such conservation measures will enable these reefs to recover from the global impacts of climate change, and we will continue to document and observe the changes in these reef communities over time.